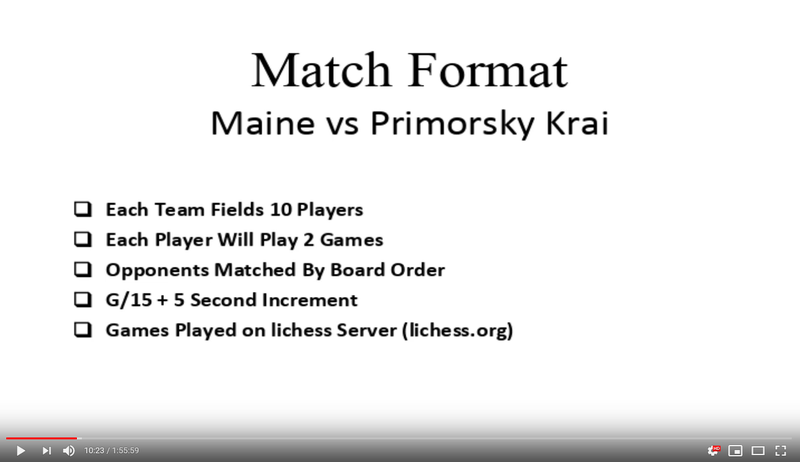 02.09.19 On Friday, February 8th at 6:00 p.m. eastern U.S. time, ten scholastic chess players from Maine took part in an online chess match with ten players from the Primorsky Region of far eastern Russia. 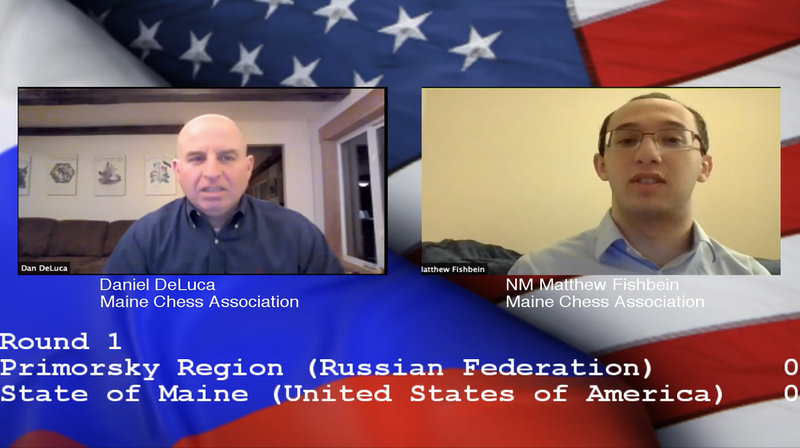 This first of its kind match was played on the lichess server and broadcast live on the Internet with commentary provided by Maine Chess Champion and National Master Matthew Fishbein. Here's the match report with games, results, and images from the day. 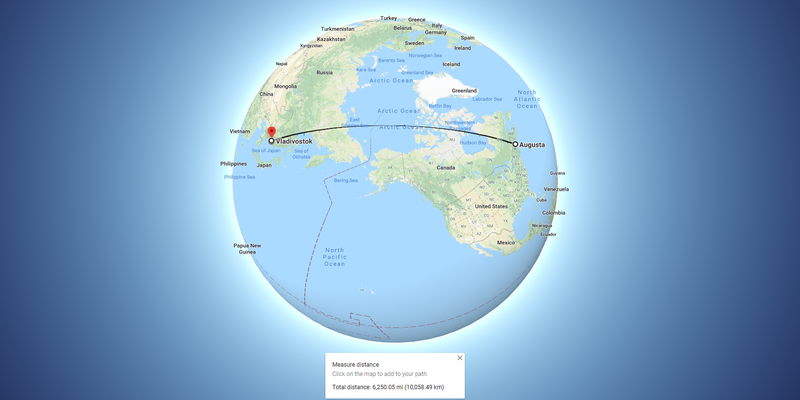 traversed 6,250 miles and 15 times zones! Organizing, directing, playing, and broadcasting a match with players at a distance of 6,250 miles and 15 times zones apart did present some technical, linguistic, and cultural challenges. Nevertheless, our sincere thanks to all who participated in this great event. The entire experience, from the first email received from Dr. Pavel Sulyandziga suggesting the match to the virtual handshake at the conclusion of the last game, was a learning experience for all involved. 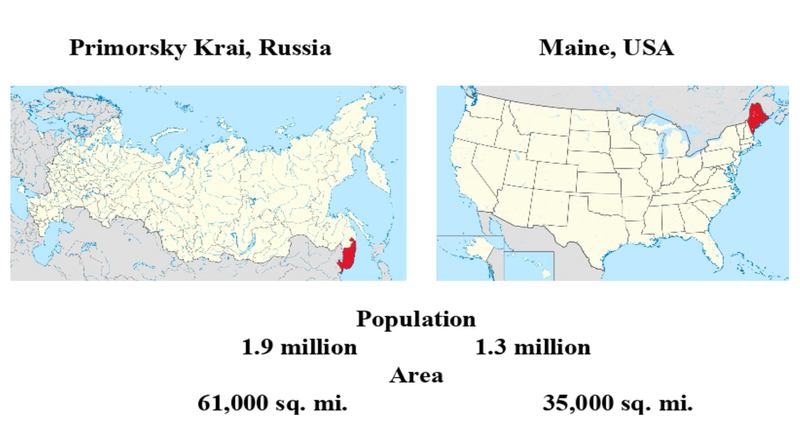 The Maine-Primorsky Krai Scholastic Chess Match consisted of two ten-person teams playing from just about as far away from each other as mathematically possible on planet Earth. Each player contested two games, one with each color, at a time control of G/15 +5 with their board-ordered opponent. The games were played on the lichess server. Here are the board number placements and ratings of the players. The final score of the Match was Primorsky Krai 15.5 Maine 4.5. Here are links to all twenty games in board order. Although the online live broadcast did have technical glitches, we broke new ground, learned from the experience, and are determined to increase the quality of the broadcast for future matches. Broadcast hosts Dan DeLuca (left) and Matthew Fishbein commented on the match in progress. Using the lichess analysis board, NM Fishbein was able to provide his insights on various games. 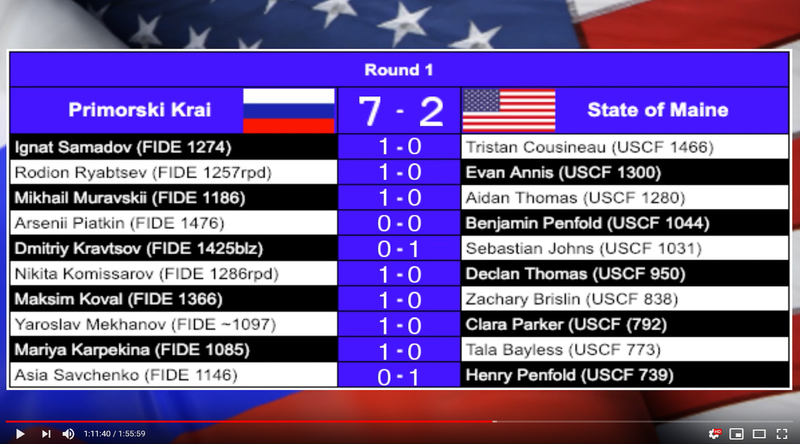 Round 1 results: Team Russia got off to a running start. We hope to bring you more of these events in the future. Thank you for your support! Thanks a lot from Primorye to Dr. Pavel Sulyandziga, all organizers, players and commentators for this match. It was very good idea to organize such great event. I hope it was not the lonely one match. I want to believe this first game will be the beginning of a series of regular games between our regions. Thank you to our superb hosts, Dan DeLuca and Matthew Fishbein, for bringing us this groundbreaking broadcast. It has certainly heightened the international nature of our sport. 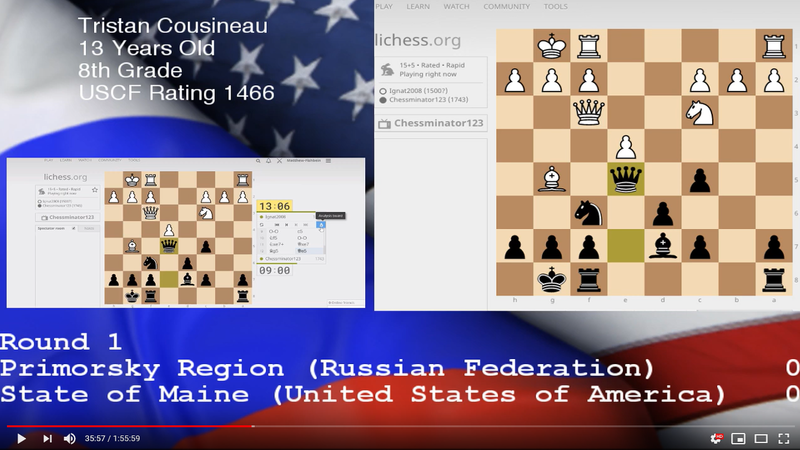 Congratulations to all the Maine kids and chess ambassadors that played. Let's prepare for the rematch. Just a marvelous idea!! Congratulations to all that played and brought this to fruition! If this can continue, and expand for all of Maine, this would be wonderful! Again, kudos to you for bringing about this terrific idea.